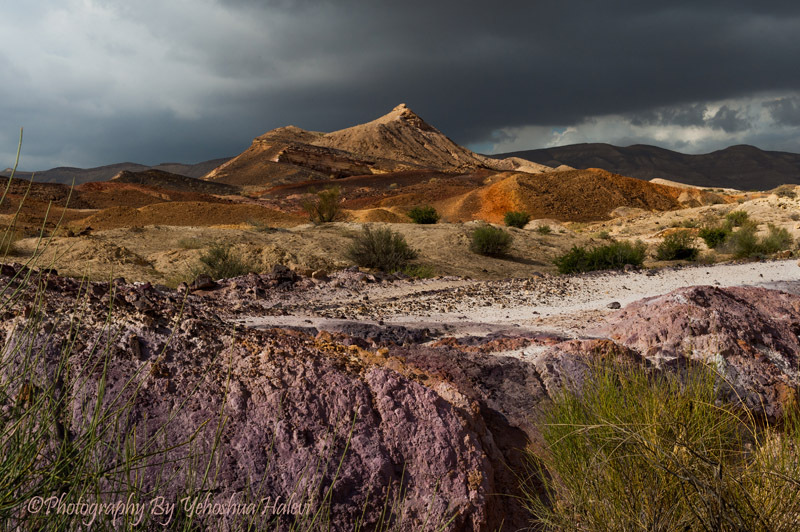 Suffering from cabin fever on account of the chilly weather and the morbid cold front that has lately descended upon the human race, I grabbed a friend and took a road trip last week to the warmer climes of HaMahktesh HaGadol, Israel’s “large crater” in the Negev Desert. At ten kilometers wide, the crater is duly impressive but it is the smaller features that lend themselves more easily to photo documentation, especially on a day when cloud cover, lighting and air temperature changed about every five minutes. This was an outing of pure adventure, with no specific itinerary and no plan as to where we would be at any point of the day. So, of course, we stumbled upon the best location at the worst time – mid-day – when the high sun cast ugly, high-contrast light across the sandstone terrain or was completely obscured, leaving a grey and lifeless landscape. Still, sometimes these outings serve as important scouting trips and the best photography is reserved for another time. But not on this afternoon. I have often preached patience as a vital tool for capturing an extraordinary image. This section of the large crater is called the “Colored Sands” because of the rich mineral content which gives the area a range of hue normally reserved for a box of crayons. Burnt umber, cadmium red, ochre and red-violet, not to mention the steely-blue skies all combine for an astonishing palette of color. I waited and was rewarded. Shifting moods as the sun crawled out from beyond a cloud, the light danced across the distant peaks and the desert sprung to life for a split second. This week, we celebrate Chanukah, the Festival of Lights. At a time when the world seems to be growing increasingly dark, may we find renewed hope in the glow of the menorah that kindness, charity, and above all, humanity, will prevail in the fight against intolerance and evil.